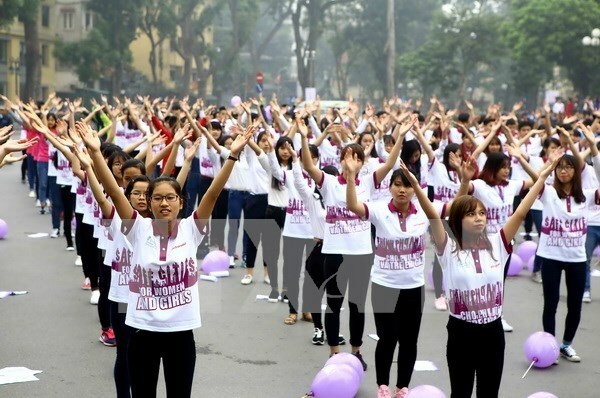 Hanoi (VNA) – The Vietnam Women’s Union (VWU) and relevant agencies need to set out specific targets and breakthrough measures to bring all-aspect equality to women in the new period. Head of the Party Central Committee's Commission for Mass Mobilisation Truong Thi Mai made the statement at a workshop hosted by the VWU in Hanoi on August 4. She suggested pushing ahead with institutional reform and mainstreaming gender into law-building. After 10 years of implementing the Politburo’s Resolution No.11-NQ/TW on women-related affairs in the period of industrialisation and modernisation, the country has obtained fundamental targets, she said. However, it is still necessary to analyse positive outcomes and restrictions in the field to put forth measures to ensure gender equality, Mai added. Participants commented that living conditions of most women and girls have been improved with better access to healthcare services and more involvement in social and political affairs. Notably, the proportion of female deputies of the National Assembly and People’s Councils at all levels has been increasing through tenures. Statistics showed that 40 percent of centrally-run ministries and departments have key female leaders while 38 percent of cities and provinces have Chairwomen and Vice Chairwomen of provincial People’s Committees.